Edible and Tangible Bliss are coming to downtown Turners: the Creemee and a new gem/mineral store prepare to fill two empty storefronts. 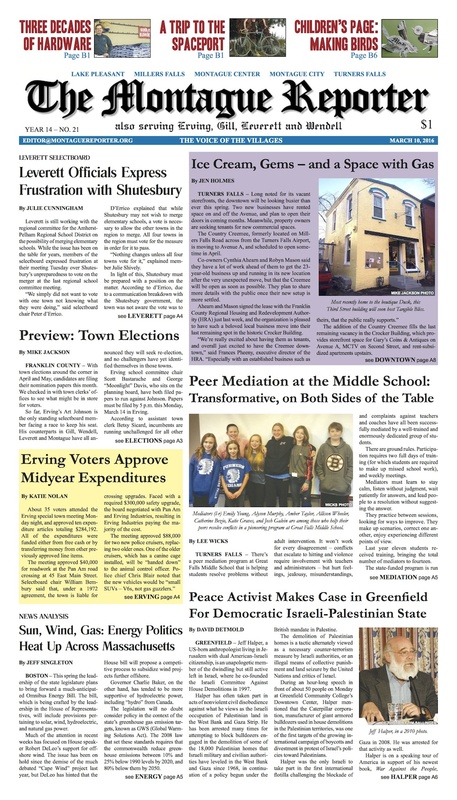 In selectboard news, the treasurer appointment debate heats up in Erving; Gill contributes to Montague’s anti-pipeline efforts and considers a Procrustean approach to firefighter recruitment; in Leverett, frustration with Shutesbury’s unpreparedness to vote on merging elementary schools; and Montague deems the skatepark “substantially complete.” We offer a preview of town elections across our reading area and a rundown of energy issues at the state and local levels. At Great Falls Middle School, peer mediators help students work things out. At GCC, an Israeli anthropologist advocates for a democratic, Israeli-Palestinian state. Our editorial and cartoon keep the spotlight on the dangers of unsecured industrial ruins. A guest editorial calls for municipally-owned cable. And, the ice is gone on Lake Pleasant. MoRe: A local (human) fixture approaches 30 years at Aubuchon. Our intrepid correspondent travels to Truth or Consequences, NM and reports back from Spaceport America. Wendell reads up on Dying Wise. 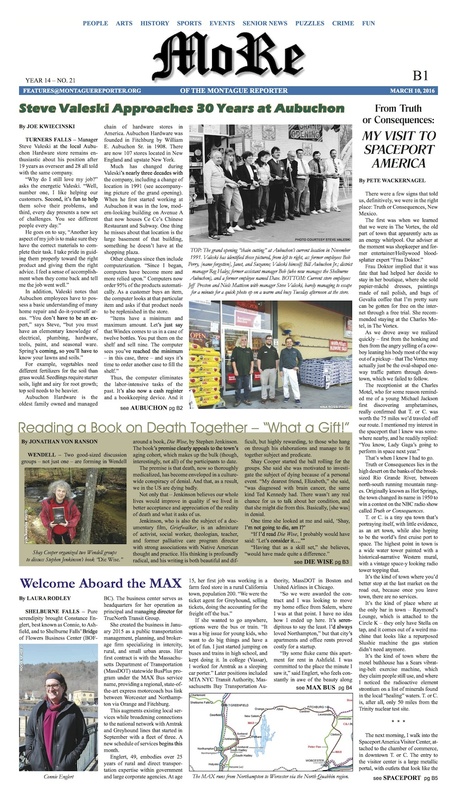 A Shelburne Falls-based transit group helps to Max-imize bus transport options in our region. Local HS basketball seasons come to an end. In the Healthy Geezer: varicose veins and you. In the Pet of the Week: warrior princess seeks home. We’ve got police logs, MCTV listings, and the usual assortment of outstanding arts and event listings to fill your calendar. Plus: a Children’s Page full of feathered friends. Wing your way to your favorite local retailer (or to your mailbox) and grab your copy today!